wrist, waist or chest that tell you exactly what your heart rate is so that you can attempt to keep it there. are a total waste of time, money and energy for healthy individuals that can train as hard as they can stand. English? Simply stated, it means the lowest possible heart rate that will improve cardiorespiratory fitness. Therein lies the problem with these formulas. rate and the maximal rate. 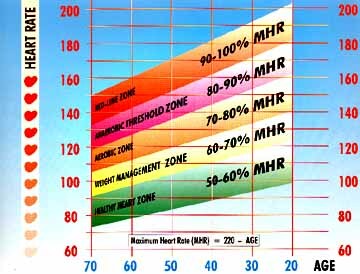 target heart rate training zone. gyms and especially in the cardio rooms of gyms. See the Heart Rate Chart for an example. Lose Fat, and Get In Shape WITHOUT Charts and Numbers! marathon runners, often measure their heart rate as part of their training to better pace themselves for a race. information that can often lead to undertraining. Yes, thatâ€™s right UNDERTRAINING. More on that later. know, â€œthey sayâ€� that training in such-and-such a zone you will burn a higher percentage of fat as fuel. specific training zone or not, you will not lose weight regardless. â€œA greater percentage of carbohydrates are used as an energy source during exercise of higher intensity. in the long run, it will do more for you. training in the weight room and ultimately, lead to better results overall. know if you are going to leave the gym that day and feel victorious, or merely accomplished. die, but you got in better shape because of that effort. That is the point that I am making. got a great body by training comfortably.